Increasingly more, people are finding out about San Diego mold and flood damage, both physically and structurally, it can create a lot of damage. Mold is among the leading causes for today’s health problems and is an issue we all need to be concerned about. When you have need for residential plumbing San Diego call us to do your plumbing repair, but if you have a flood we recommend Gold Coast Flood Restorations for San Diego water damage repair and mold remediation. We can not inform you enough – mold must be taken seriously. When flooding happens, there’s not a minute to lose. Drying your residence or place of business as fast as possible not just avoids structural damage however removes the needed environment for mold to grow. Runny nose, eye irritation, coughing, blockage, worry of asthma, headache, or tiredness – all might be symptoms of exposure mold. Particularly prone are individuals with those currently “at threat” due to immune reduced or jeopardized health concerns, young children, and individuals with chronic inflammatory lung diseases such as asthma and severe allergies. Black Mountain Plumbing extremely advises the companies below for all your flood and mold issues. 24 Hour Emergency Service 888-373-9243 Serving all of San Diego County, we specialize in providing fast, affordable solutions to all your flood or mold problems. As a Christian-based, family owned and operated company, we’re committed to excellent service in every aspect of the job. From the initial phone call through project completion, you’ll find the highest degree of professionalism, pledge to work around your schedule, and an assurance to solve your water damage or mold problems with as little disruption as possible. 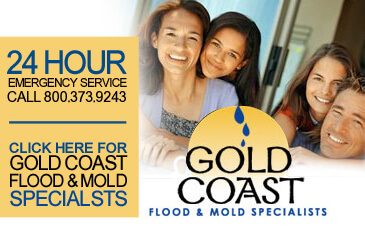 Whether it be a roof leak, slab leak, pipe leak or sewage backup, Gold Coast Flood Restorations is here for you. We promise to:. Be prompt, courteous, and responsive to your needs. earn your trust and loyalty. Inform you about all aspects of the job. Prepare a written estimate. Offer competitive prices. Leave a job site clean. Fully stand behind our work by putting our guarantee in writing. Keep you happy and informed.